We finished roller painting the entire living room today and now just need to use the brush for trim and touch ups. The color isn't showing up very well in photos so that's why this one is mostly of the fireplace. The color is called "Clay Pebble" and is a nice balance of neutral with a hint of green. 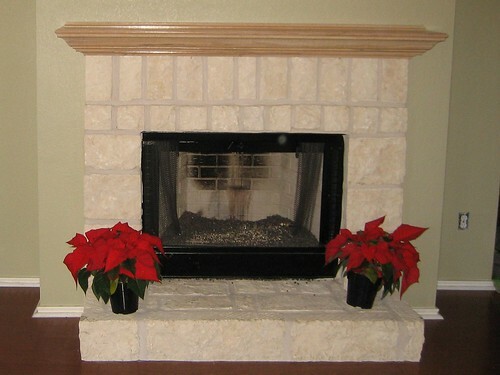 It looks nice against the stone of the fireplace and in contrast with the cherrywood floor. The color looks really good! I can't wait for more pics! Are you staying there yet?